This ice-age wonder went extinct about 7000 years ago. Its antlers were almost twice as wide as its height. The giant deer lived between 400000 and 7000 years ago, from Siberia to Ireland. Standing at around 2m tall, males grew the largest antlers of any animal, reaching 3.6m across. Like all deer, these antlers, weighing up to 45kg, were shed and regrown each year to coincide with the rut - the mating season when they display their impressive antlers and fight rivals for females. 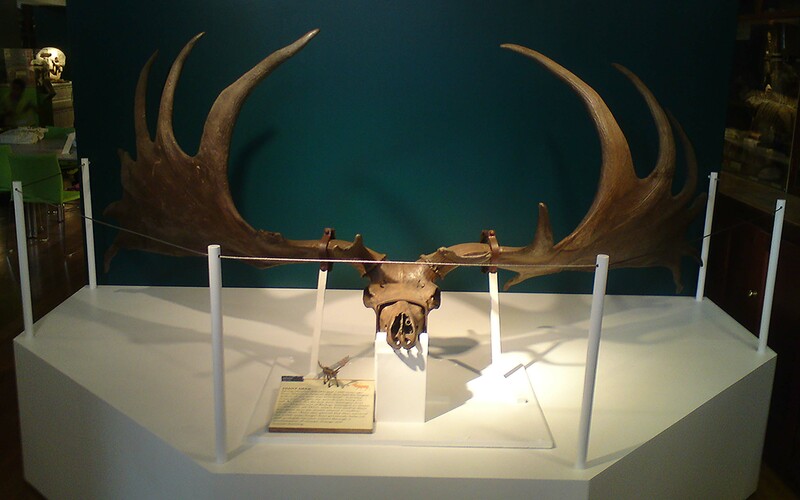 The huge giant deer skull and antlers mounted near the Museum’s entrance have been said to be the largest in Britain by eminent biologist Stephen Jay Gould. They came to the Museum in 1961 when a member of the Department saw them in a hotel in County Kildare in Ireland (this species is also called the Irish elk) and offered to buy the specimen. This specimen, affectionately known as Elkie, has caused major problems for the Museum in the past. Over the period of a couple of years he was moved many times around the University whilst building works were being carried out in the Museum’s former home of the Darwin Building. It was extremely difficult to find storage space for such a large specimen. He was the final specimen to arrive in the Museum before it reopened in our current location in the Rockefeller Building, and there was some serious doubt whether we could actually fit him through the door. In 2005 UCL scientists, the world’s foremost giant deer experts, extracted 11000 year old deer DNA from museum specimens. They showed that giant deer were most closely related to fallow deer. They also showed that their extinction date was around 7000 years ago, putting it within the current warm period. Previously it was thought to have gone extinct around 10000 years ago when the last ice-age ended. Read more about the Giant Deer on our blog and in this feature by the Londonist. With only seven examples known of this South African zebra, extinct since 1883, this is the rarest skeleton in the world.